HawkGrips® Emollients - Fabrication Enterprises Retail Sales Corp.
Have you ever been treated for soft tissue dysfunction using Instrument Assisted Soft Tissue Mobilization (IASTM)? This treatment instruments can end scar tissue build-up caused by weak tendons, muscles, and ligaments. For patient comfort, clinicians should use emollients on their patients prior to an IASTM treatment. This emollient allows for the treatment instruments to glide smoothly over the skin, preventing skin irritation. 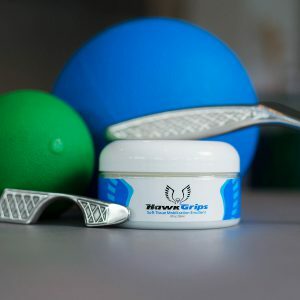 HawkGrips® Emollients work to help IASTM instruments glide smoothly over the skin while also softening and protecting the skin from potential damage. They come in jars and can be fragrance free or have a pleasant vanilla fragrance. You can buy the individual 8 oz. jar up to 20 pack for businesses that constantly use emollients. HawkHydro and Hawkhydro+ are water-based emollients designed specifically for use with IASTM tools. With all the benefits of the traditional oil-based emollients and none of the mess, HawkHydro and Hawkhydro+ are easy to use and wipe away. They are packaged in a squeezable bottle to avoid cross-contamination. You can buy the individual 4 oz. bottles up to 20 pack for businesses that constantly use these emollients. Hawkhydro+ is specially formulated to dry to a gentle adhesive that makes skin prepped for a kinesiology taping treatment. Emollients are great to use in conjunction with an IASTM treatment to prevent skin irritation. HawkGrips® has a huge selection to choose from when it comes to emollients and IASTM tools. To see our selection of HawkGrip® Emollients, click here.